Following a recent article by Trefethen [SIAM Review, 50 (2008), pp. 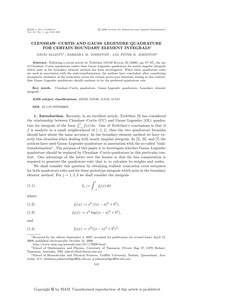 67–87], the use of Clenshaw–Curtis quadrature rather than Gauss–Legendre quadrature for nearly singular integrals which arise in the boundary element method has been investigated. When these quadrature rules are used in association with the sinh-transformation, the authors have concluded, after considering asymptotic estimates of the truncation errors for certain proto-type functions arising in this context, that Gauss–Legendre quadrature should continue to be the preferred quadrature rule.